2013 will mark the 100th anniversary of the founding of the Harriman State Park Group Summer Camps program. In celebration of this important centennial, the Historical Society of Rockland County (HSRC) is delighted to announce that it will host an exhibition of the Harriman Camp Experience. The exhibition is being curated by Sue Scher. The exhibition opens on May, 18 2013, and continues through September 15, 2013. Exhibition hours are Wednesdays through Sundays, Noon – 4pm. Admission is FREE (donations are greatly appreciated). An opening reception was held on Saturday, May 18th from 1 – 3pm. The group camping program started 100 years ago with the belief that parks should be for all people, particularly the underprivileged that did not have fresh air or leisure time. 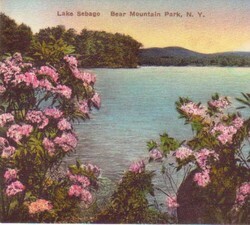 To address the needs of the urban poor, particularly in NYC, the Palisades Interstate Parks Commission instituted social relief programs at more than 100 camp facilities in Harriman State Park. Sponsored by social and philanthropic organizations, thousands of New York and New Jersey children came to the park every summer to experience nature. The program was so successful that it was repeatedly emulated throughout the country. This exhibition will tell their stories using archival photos, historical text, video clips, camp paraphernalia, interactive maps, and visual presentations. It will also include an interactive component allowing visitors to record their own camp stories to help create an oral history of the program. Primarily, the exhibit will feature the children’s camps, but will also highlight the worker, family, and outdoor camps. This exhibition has been made possible by generous contributions from: United Water, Orange & Rockland Utilities, The Sheridan Family, The Len Camber Trust, The Palisades Park Conservancy and Sotheby’s. In addition, the HSRC gives special thanks to the Elizabeth Sayles, Maryann Struett and The Palisades Interstate Parks Commission for their assistance with the preparation of this exhibition.